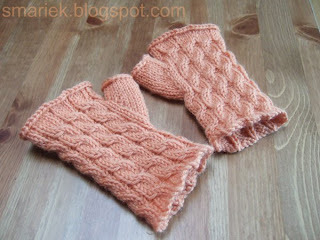 The peachy mitts are finished. It's made with the same yarn, Elann Highland Wool and color as my Shadow Cable Scarf. I modified the pink kindergartener sized mitts slightly to make them adult sized. They fit my hands, which means a small ladies hand. This photo was taken yesterday after Missy & I played with playdoh. Since many of the colors had dried up, I had to add water and knead them. There's still a tinge of blue/green after washing my hands. You should have seen my hands before I washed them! I haven't gotten around to writing up a "how to" for these mitts. They're so ridiculously basic that you can just wing it as I did. Do you remember the loopy piece of yarn on Missy's purple Pythagorean Hat? (boo boo seen here; Pythagorean Hat pattern here) Well, I managed to fix that little boo boo with a crochet hook and some patience. That was easy! Now I've got a more serious problem with her purple Asherton Toddler Scarf. Look what I found! A hole!!!!! And SEVERED yarn!!!! See those two yarny ends sticking up? Anybody have ideas for fixing this mess? Can it be saved? Or does the scarf need to be tossed out? On a happier note, here's something I received today. Knit Picks Nickel Plated Sock Size DPN set. I can't wait to try them out. Now you'd think that I'd have time to knit on those days when Missy goes to daycare. I envision myself sitting on the sofa, watching a little telly, and doing a little knitting. That has never happened! I always end up doing house things, running errands, etc. Those are rather crazy days for me. 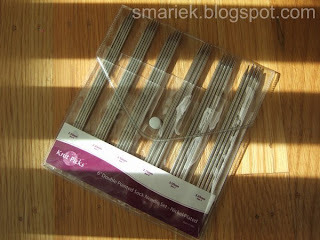 Perhaps I'll get to play with my new pointy sticks tonight. Have a sweater project you've been meaning to start? Join the Fashionably Late KAL! Perhaps it'll give you the extra little push you needed to cast on or dig out that WIP. Okeedokee, my time is up, gotta go! I love how the mitts have a pedigree. It's especially funny how they go from "granddaughter" to "daughter" to "mother" instead of the other way around. 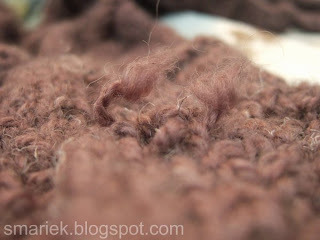 Can you duplicate stitch in the area of the hole in the scarf, and weave in the new ends? Not sure what the stitch pattern is there, if it's easy or hard to follow. But you could at least try, and see what happens. Enjoy your new pointy stix! I like the peachy mitts. Very nice. My hands were bluish green for a few days after the 2 yr old got ahold of a marker. At least it was washable and came off the table easily. Still. Yay for the new DPN's!! Can't wait to see what you do with them. I love your peachy mits - very cute! As to the hole - I would just carefully tie the ends together and "smoosh" the yarn around them. It looks like it is they type of yarn that would hide that. There may be some trick for tying some thinner yarn to the ends and weaving them in but I don't know it! 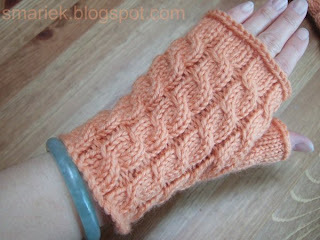 I've been watching your progress on the mitts and I'm amazed at how fast you've been turning projects out! I strive to be that quick! All your projects are just beautiful. One of my current wip's is the palindrome scarf and I'm loving it. I'd go with the duplicate stitch myself before frogging it. 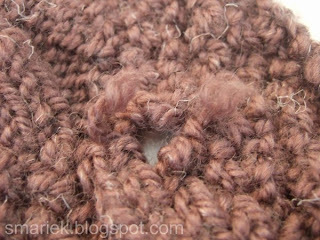 Or... depending where the hole is ie: near the end... you could unravel it to the hole, fix the yarn and reknit it. Unless it's felted... then yeah, you're out of luck then. Good luck mending the scarf.